All the four days we met in the brilliant atmosphere of the National Ashland Spring hotel. 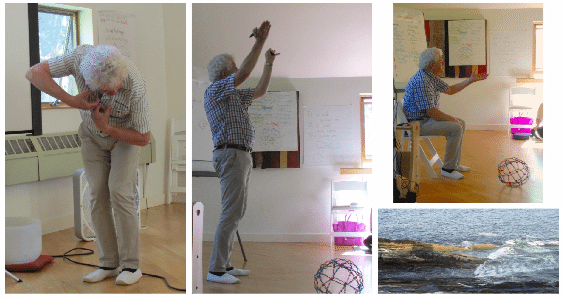 The group of participants was very open for spiritual aspects of life and nature, so we had a very good workshop. Here are some pictures to show you that. took place a quite another atmosphere as in Ashland. This time it was not very hot, we were near the ocean and this time it was Thom Myers who made the course much more interesting by his contributions and because the constantly introduced thems and questions from the domain of Anatomy Trains. I learned a lot. Thank you so much for your thoughtful email, and for sending these lovely photos along. are looking forward to future collaborations and hopefully a potential return visit in 2020.
we are so pleased that you had a good experience while teaching here. The course that I finally gave in KESWICK (VA) 25 till 29 JULY 2018 was nearly the climax of this USA trip. 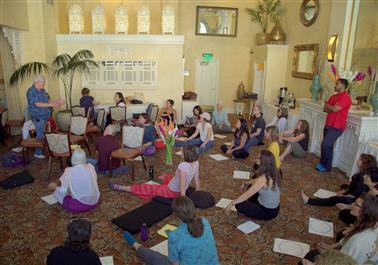 The course was organized by Kate White on behalf of the APPPAH in the dramatic and beautiful setting of the retreat center Bridge between the worlds. This time the main part of the participants were not osteopaths or craniosacral therapist but coming from the domain of trauma therapy, prenatal psychology. Again a relatively high level of spirituality was demanded and therefore allowed to be presented. I hope you are integrating all the information we learned from Jaap Van Der Wal well. I am attaching a few photos of all of us and the final copy of the sign in sheet (thank you Karen Mulder, who did a fabulous job of helping us! Jaap, thank you so much for a great time. We are thrilled to think you will return to us in 2020 or 2021. Thank you again for coming and making this experience great. Everyone. Your names will go into our mailing list so you can hear about our offerings. Just remove yourself from the list if you don't want to receive newsletters, or respond to this email and tell me you are not interested in receiving notices. Bridging between the worlds, Jaap brings us into our embryo's mysterious world in a most profound self- discovery process where and when spirituality and science can meet safely. This course represents the validation of both my personal and professional life experience and the boost I needed now to take me to the next step of the healing journey chosen in this incarnation. I am in awe. Eternal blessings and much gratitude to Jaap and our Guides Kate and Maggie. This gorgeous Chiluhly glass sculpture in Biltmore Gardens reminds me of an embryonic Egg Cell surrounded by it's zona pellucida! A huge thank you to brilliant embryologist, Jaap van der Wal, who I just continued studies with! What a kind, generous, passionate teacher! Thank you to Els, his wife, for sharing your return to life story! Thank you to the dedicated, loving colleagues who joined me at the retreat center, Bridge between the Worlds!